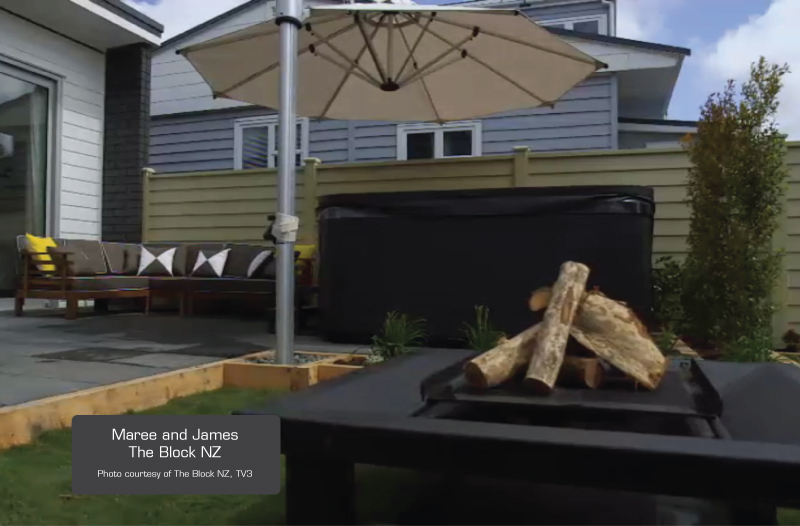 Each week on The Block NZ we have seen the couples renovate a portion of the house as well as an outdoor area. South Auckland contestants Maree and James – The Block from have been decorating their Block home with a natural and pasifika style décor. When it came to outdoor week they wanted something of high quality that would stand out for the judges. Maree contacted Shade7 to purchase a 3.5m Octagonal Riviera Cantilever Umbrella in an Ecru colour to match their natural theme. The Riviera Cantilever Umbrella was specifically chosen so that it could sit in the centre of their outdoor area and rotate to offer shade coverage over their spa pool, dining area and the lawn. Shade7 Managing Director Michael Pearce is excited to see their popular cantilever umbrella showcased on The Block. “I think that Maree and James have made a clever choice with our Riviera Cantilever Umbrella. Not only is it very practical with its 360 degree rotation and 3 tilt positions, but it really is an effective statement piece to add style to any outdoor area. I wish them well in the final weeks of The Block”. The Riviera Cantilever Umbrella was designed and engineered by Shade7 and launched two years ago. It has been specially designed to withstand New Zealand’s intense sun, strong winds and rain. Shade7 have sold thousands of Riviera Cantilever Umbrellas across New Zealand, Australia, Hong Kong, USA, Mauritius and across the Pacific Islands. It is available in a variety of colours and is suitable for both residential and commercial settings. View our Riviera Cantilever Umbrella Shade7 Riviera Cantilever Umbrella or visit us in our Auckland showroom.